According to Cancer.Org, there will be an estimated 1,735,350 new cancer cases diagnosed in 2018, adding to the 15 million survivors. 2 of the most commonly diagnosed cancers are breast cancer and prostate cancer. Exercise is a critical element of the recovery process, and the surgeries and treatments require care and understanding of the parts of the body that are impacted and how to help direct safe and effective exercise programs. The information in this post covers five top exercises for breast cancer with lumpectomy/mastectomy (partial or full removal of the breast tissue), and prostate cancer Retropubic Prostatectomy (surgical removal of the prostate using an incision in the abdomen). Cancer Exercise Specialists who have received Advanced Qualification from the Cancer Exercise Training Institute learn about 25 different types of cancer, the accompanying surgeries and treatments, and how to design safe and effective exercise programs that take into account the physical and mental impacts of the treatment methods. These exercises are not all inclusive, but provide a safe place to begin when instructions and cautions are followed. One should always begin with at least a five minute cardiovascular warm-up (walking, climbing stairs, marching in place (seated or standing). Some people who are currently undergoing treatment may find that two minutes is all that they have the energy for. That is perfectly okay. Only do what is comfortable on any given day. You can also perform several minutes of cardio at different times throughout the day. Start with only a few repetitions and gradually work up to the recommendations as your body allows and in the absence of any swelling in the affected area. Following a lumpectomy or mastectomy, there is bound to be tightness across the chest and into the upper arm (particularly if there was a lymph node dissection and/or radiation). This can have a negative impact on posture, causing pain and leading to future joint degeneration, as well as limited range of motion in the affected arm and shoulder. These five exercises will help to stretch the chest and lats, strengthen the upper back, and bring the head back into alignment, countering upper-crossed syndrome. Do not begin this exercise program without consulting your physician. These exercises are not intended for use by every breast cancer patient/survivor and if done improperly may result in injury or other side-effects. At any point during your exercise session, if you experience swelling in affected area or unusual pain or discomfort, stop exercising or modify your position. If it continues consult your doctor before resuming your exercise program. Lat stretch (If there are knee issues that cause pain or discomfort in this position, try a modified pose keeping knees at 90°. Alternatively one can sit in a chair and stretch arms over a table. Reach forward as far as possible in the absence of pain. Hold for 20-30 seconds. Repeat several times per day. 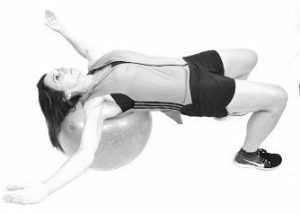 Supine ball chest stretch (begin on the floor, a yoga bolster, or exercise bench, working up to ball when strong and stable). Begin with arms straight overhead, palms facing one another. Allow arms to gently fall out to side (slight bend in elbows) in the absence of pain. *Do not perform this or any other chest exercise while expanders are in place and for at least 6 weeks after removal. Start with limited range of motion and progress as your body allows. Hold for 20-30 seconds. Repeat several times per day. Isometric shoulder blade squeeze (make sure to BREATHE as holding your breath will increase your blood pressure). Squeeze elbows back (like a bird) and hold for 3-5 sec. 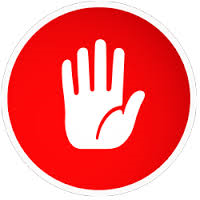 Do not allow shoulders to elevate and keep head in neutral. Repeat several times as tolerated. Repeat several times per day. Reverse fly (do not wrap bands around hands if you are at risk for lymphedema). Begin with the lightest amount of resistance (yellow band usually) holding arms straight out in front of you and parallel to floor. You will need to find the right distance between hands to achieve desired tension. 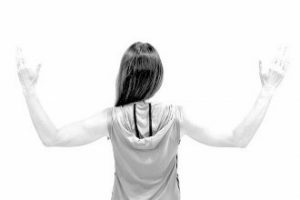 Retract your shoulder blades (squeeze together) and, keeping a slight bend in elbows, bring arms out to the side as far as you can without locking your elbows and no pain. Do not allow shoulders to elevate and keep head in neutral. Repeat up to 12 times (as your body tolerates). Start and progress slowly, particularly if at risk for lymphedema (too much too soon may trigger swelling). Perform this exercise 2-3 times a week with a day in between. Head retraction (can also be done sitting upright pressing against car seat headrest). With shoulders back and down, belly button drawn toward spine, and low back in neutral, push head back gently against pillow. Chin should remain in neutral; not tucked or lifted. Hold 3-5 sec and make sure that you are not holding your breath. Repeat several times per day. Following a retropubic prostatectomy, it may be difficult to stand erect with good posture. This can be due to pain, fear, or a combination of both. Until desirable posture is achieved, one should avoid any form of “crunch-type” exercises as that will only exacerbate the forward-flexed position. Alternatively, exercises should focus on stretching out the abdominal area while simultaneously strengthening the core musculature. Do not begin this exercise program without consulting your physician. These exercises are not intended for use by every breast cancer patient/survivor and if done improperly may result in injury or other side-effects. Lie in prone position with arms at sides (shoulders stacked over elbows). Contract glutes, engage abdominal muscles and gently push up (as pictured). Pause for 3-5 seconds. Repeat several times as tolerated. Repeat several times per day. Bridge (begin on the floor, working up to BOSU(R) when strong and stable). 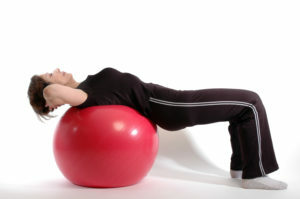 Lie in supine position with arms at sides, knees bent, and stacked over ankles. If need be, place rolled-up towel or pillow under head to support neck. Contract glutes and push up through heels into bridge position. Continue to contract glutes and push both thighs gently towards center. Pause for 3-5 seconds. Repeat several times as tolerated. Repeat several times per day. 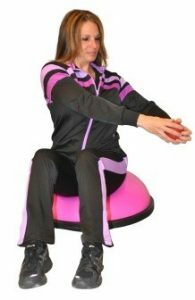 Oblique twist (can be done sitting on the edge of chair or weight bench if BOSU(R) is unavailable). 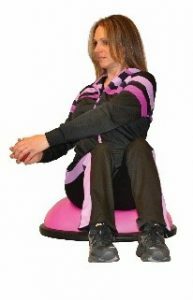 Sit on center of dome with legs about shoulder width apart (wider for more stability) and abs drawn in toward belly button. Hold a 1-2 lb. medicine ball in between both hands and begin with your arms on one side. Once you have your bearings, look forward and remain that way as you rotate your arms from one side to the other. Repeat up to 12 times on each side (as your body tolerates). Perform this exercise 2-3 times a week with a day in between. Bird Dog (begin on the floor, working up to BOSU(R) when strong and stable). Begin in quadruped position on the floor. Raise Left arm and right leg simultaneously. If this poses a balance challenge, begin by raising only the arm or only the leg. In either situation, draw belly button to spine, engage glutes, and keep neck in neutral. Hold for 3-5 sec. and perform on other side. Repeat several times as tolerated. Repeat several times per day. Multi-planar squats on BOSU(R) (begin on the floor, working up to BOSU(R) when strong and stable). Stand with feet shoulder width apart and hold a 1-2 lb. medicine ball between both hands. Slowly sit into a “squat” position with arms in front of thighs. As the legs straighten (don’t lock the knees), slowly raise arms up and overhead (don’t lock elbows). Maintain good core control and continue to draw belly button toward back. Repeat up to 12 times (as your body tolerates). Start and progress slowly, particularly if at risk for lymphedema (too much too soon may trigger swelling). Perform this exercise 2-3 times a week with a day in between. Perform this exercise 2-3 times a week with a day in between.